Seniors aging in place need to make sure everything in their home is well-fitted for their maximum comfort. If you have a health condition like osteoarthritis, you’re well acquainted with the pain and swelling it can cause to your joints. You know first-hand how it can affect your ability to do everyday tasks. That’s where our Best Bottle Pouring and Cup Drinking Aids for Elderly can help with ways to make your life easier, allowing you to cook, eat and drink with the same ease you have in the past. Will These Products Help Me? What Are the Benefits of These Aids? Is There Anything I Need to Know About Using These Products? Where Can I Buy These Aids? This grip cup is comfortable to hold and won’t slip out of your hand. They are both dishwasher and microwave-safe. Professionals in the field designed this product with seniors in mind. They are incredibly durable and will last. They have an attractive design with pleasing colors. The company produces them in the United States. The Marusya Inc’s No-Slip Easy Grip Cup is an ideal solution if you have issues with getting a secure handle on the cups you use, possibly due to weak or shaky hands. This product comes with grip spots for your fingers that allow your hands to fit easily, so you don’t need to worry about the cup slipping through. The product is also designed to be sturdy and is virtually indestructible, so you needn’t worry if it happens to fall off the counter. Since it’s so sturdy, you can also rest assured that it will fit into your current cup collection without the need to be replaced frequently. Occupational therapists specifically designed this cup so that it fulfills the needs of these seniors with reduced strength or limited mobility, so they’re also lightweight and easy to balance when you set them down. They are a great size for most drinking uses and come in a variety of colors to match your kitchen style. This dual-handled mug is great whether you’re left or right handed. Added stability for those who experience minor hand trembling. Added security for those with arthritis, limited wrist, hand or finger strength. It is a bit heavy for some individuals, especially when filled. People with large hands may find the handles are too small. Seniors with weak hands, arthritis, or any type of mobility condition such as Parkinson’s, will understand how dangerous it can be to enjoy hot beverages. Even the slightest movement could cause an accident with the hot liquid spilling onto you. 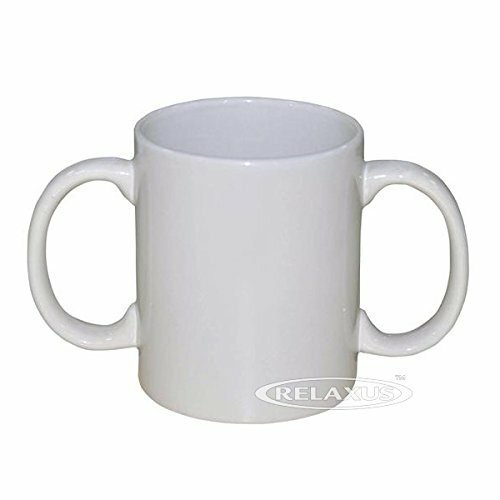 With the Relaxus Dual Handled Mug, you can enjoy your coffee or tea just like you used to, with the added support of a dual handle. The mug is classically designed to keep beverages warm, though without a lid your beverage will cool pretty quickly. It is a nice size that is well-balanced and holds a generous amount of liquid. 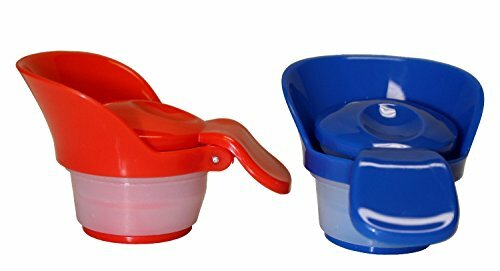 If you have extremely shaky handles or mobility problems, we may not recommend this product because it still lacks a lid or spill proof design. Instead, this mug is the best option for seniors who may have weak hands or arthritis in one hand where the pressure needs to be removed as they’re lifting cups. Its standout feature is the fact that it is spill-proof. 1 Unit of Independence 2-Handle Clear Mugs - Cup Includes 2 style lids. Crystal clear construction allows the contents to be seen at all times. Use with warm or cold liquid - Dishwasher and Microwave safe. You can use it with both cold and hot beverages. It is both microwave and dishwasher-safe. The manufacturer produces them in the United States. You can use a straw with it. The base of the mug is larger to prevent tipping. 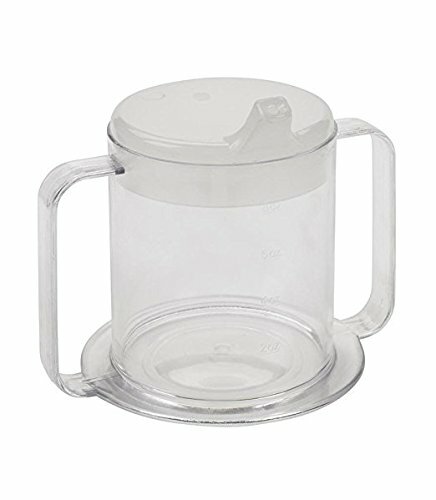 The Independence 2-Handle Plastic Mug offers a safer alternative to glass or ceramic cups. The product is valued priced with three included with your purchase, and it is made out of a clear plastic material. With this mug, the senior using it is kept safe from breaking it or accidentally spilling their beverage. Even if it drops on the floor, the plastic material protects it from damage, such as with a glass or ceramic cup. Therefore, this mug is an especially great option for seniors who live alone and can’t physically clean up accidents like broken glass. You can use this mug with or without a spout, though there are also openings for straws. The manufacturer took care with the design to fashion them with a larger base, making it more balanced to be set on a table. We feel this mug is the best option for seniors who might be suffering from Parkinson’s or a similar mobility condition. These value-priced cups are easy to hold and spill proof. The design of the handle makes it easy to hold. You can use them with both cold or warm beverages. You can run them through the dishwasher. The company stands behind its product with excellent support. You’ll need to use a specific straw with a wing stopper for optimal use. Some may find the handle a bit awkward to hold. These Providence Kennedy Cups are specifically designed to prevent all spills, even if they end up being turned upside down. With this cup, you can use it witch straws and even lay in bed as you sip your beverage. The cups hold about 7 ounces, which may be enough for most individuals, though there is no option for a larger size. We recommend these cups for seniors with weak or shaky hands, but feel that two handles would only get in the way. 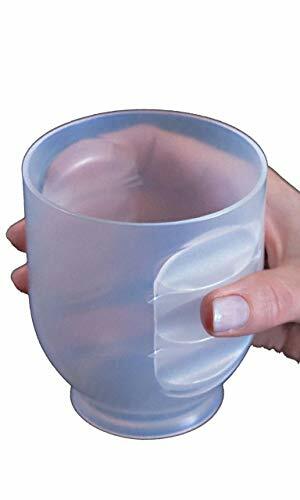 This specific Kennedy cup only comes with one handle, so if you have arthritis in your dominant hand you may choose to opt for a style with two handles so you can help relieve pressure off of the hand. Otherwise, this is a great option, especially for seniors who live alone and can’t always bend down should there be any spills. The simple design makes a huge impact to help our heavy bottles. The design is compact and won’t take up a lot of room in your refrigerator. You can put it in the dishwasher. It is lightweight and doesn’t make the bottle seem more weighty. It holds the bottle securely. It adds to the stability of the bottle. The fit is secure, which makes putting in on the bottle difficult. The Cooks Innovations Universal Bottle Handle allows seniors to continue enjoying their favorite beverages and even continue entertaining at their household without having to worry about picking up heavy two-liter bottles. The design is simple yet effective, which speaks a lot to the manufacturer’s ingenuity. The holder fits over most of the body of any two-liter sized bottle with a good-sized handle that is adequate for most anyone. If you’re a senior who is used to entertaining at your house and need to continue purchasing large bottles of beverage, this holder allows you to continue hosting despite your age or strength. However, we do not recommend using this holder if you know you cannot pick up the weight of a two-liter bottle. While a bit expensive, it offers an excellent solution that is secure. 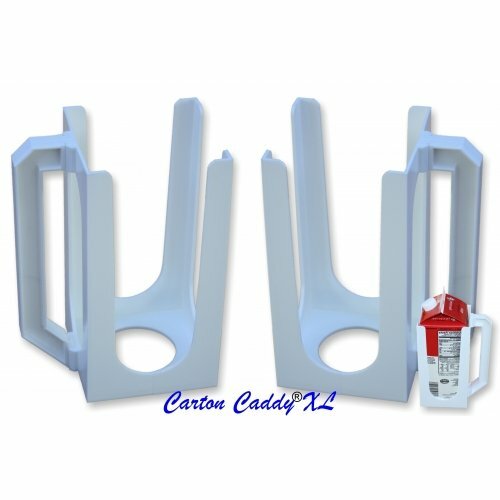 The Carton Caddy XL is top rack dishwasher safe, just as the standard carton caddy is dishwasher safe. For those who like the security of a more traditional holder, the Carton Caddy XL will your best selection. It adds a lot of stability to the carton. You can put it in the top rack of your dishwasher. It is well-made and will last. You get a secure handhold using it. Like the Cooks Innovations Universal Bottle Holder, the Carton Caddy XL Juice Holder transforms any beverage carton you have in your fridge into an easy-to-pour container. Many cartons are flimsy and not as sturdy as plastic bottles, so they’re even harder to pour for seniors who may have weak hands or arthritis. This item makes pouring from cartons easier by strengthening the container with a solid frame that fits around them. It’s a convenient, hands-free way to dispense beverages. It won’t leave a mess. It dispenses only when something activates the trigger. You won’t have to lift heavy bottles to pour yourself a beverage. It’s an excellent option only if you usually buy larger sized bottles. Cleaning the tube is a challenge. The Magic Tap is the best option for seniors with limited mobility and strength. This tap will fit into most large bottles, and once it’s fit into one all you have to do is push your cup against the blue trigger. This allows you to dispense any beverage hands free, eliminating the need to unscrew caps, lift bottles and pour. Installation is also very simple, and most seniors should be able to handle it on their own. 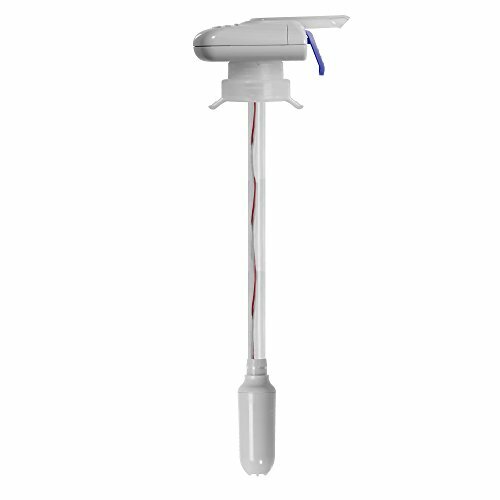 The tap will also eliminate drips and spills, allowing you to enjoy your beverage instead of worrying about accidents. These spouts eliminate spills and drips. It doesn’t drip or spill. It fits snugly in the bottle. It maintains the freshness of the liquids. There are two colors so that you can use a specific one for each type of beverage. It has a graduated fit. It has an easy-to-open flip top. It won’t fit on all containers, especially oversized ones. The Jokari 2 Count Push-and-Pour Milk Spouts replaces the standard caps on bottles with one that is easier to pour without leaving a mess. It won’t drip, so that your refrigerator stays clean and you won’t have to worry about cleaning up any mess. All you have to do is swap out the existing cap on your bottles with this one. It’ll keep the contents fresh just like before. We feel this is the best option for seniors who may only have problems unscrewing caps, because you’ll still need to be able to lift the bottles that the cap is attached to. With these products, you’ll find simple tasks more manageable, which will go a long way to improving your quality of life. The answer is a resounding yes. You’ll find simple tasks more manageable, which will go a long way to improving your quality of life. They accomplish this in several ways. With the bottle and drinking aids that we’ve chosen, you’ll find items that leverage your strength better to help you hold on to handles and grips better. Some replace existing caps with something that is more user-friendly, and others transform traditional cups into versions that are easier to hold and spill-proof. To do that, manufacturers design them with the principles of ergonomics in mind to make them more comfortable and efficient to use. These modifications vary widely from soft grips to different weight distributions or added features like a second handle or a more useful upgrade of a typical product. They typically have non-slip or textured surfaces to make them easier to hold. Often, the changes are surprisingly little but significant in the improvements they offer. Many companies work with professionals in the healthcare industry to modify everyday objects into items that are better suited to the needs of the elderly as well as other individuals who may have similar difficulties because of different physical limitations. Their most significant advantage is removing the uncertainty and difficulty about being able to do a task. The manufacturers design these products with the senior in mind along with the challenges many likely face. Convenience is a driving factor in the construction. They also address the health issues that can make everyday things more difficult, such as shaky hands, limited strength, arthritis and joint pain, and mobility conditions. The Centers for Disease Control and Prevention estimate that about 30 million American adults have osteoarthritis. Classic symptoms include stiffness and a marked difference in the range of motion. These products offer ways to manage while providing a means to avoid aggravating joint pain. You’ll often see items with extra padding or cushioning on handles to reduce stress. These use modified designs to help you open a container with less effort and to minimize discomfort in your hands. Some options also make using a cup and dispensing beverages easier too. They can also help prevent accidental falls in the kitchen by reducing spills. Many options are either spill-proof, are make holding heavy bottles easier so that you’re less likely to drop or spill the beverage. The National Council on Aging recommends that you clean up any right away to avoid slippery floors, which can then lead to dangerous falls. The primary purpose of these aids is to help individuals maintain an active, independent life. 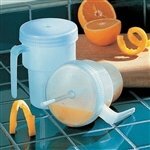 If a pouring spout makes it easier to enjoy your morning orange juice, it has more than accomplished this goal. When you find the right products for your unique situation, these products offer an excellent way to live independently as you age. While the manufacturer markets them for senior use, individuals of all ages will find them useful. The operative word when describing these items is convenience. They make things easier and often eliminate small yet annoying issues like drips or slips. Be aware that many are standard size and won’t fit on smaller or oversized containers. Though many are ergonomically designed, they may differ quite a bit from the household objects and utensils that you usually use. It may take a bit of time to get used to a new handle, especially if it’s a stark departure from others. However, you’ll find that after a few times of use you probably won’t notice the variation. The essential thing to remember is that conditions like arthritis get worse over time. With pouring and drinking aids, you can empower yourself and help prevent pain and swelling while allowing you to maintain your independent lifestyle. These lifestyle changes can have a profound impact on your overall quality of life. Another thing to keep in mind about these products is that some may replace existing bottle caps. Be aware that many are standard size and won’t fit on smaller or oversized containers. We suggest reading the product descriptions carefully to see which ones they will work with before you buy them. You can find them in brick-and-mortar stores or from online retailers like Amazon. Most are reasonably priced with detailed product labels to help you narrow down your choices to those that will work best for you. Most are value priced, making them a smart and affordable investment. If you have a unique situation, an occupational therapist can help you identify goals and recommend ways to accomplish them with specific types of products. If you’re uncomfortable using them, they can train you on the correct usage so that you can get the most out of them. The best bottle pouring and cup drinking aids for elderly individuals empower them to help them live an independent life and stay in their homes as long as they wish. These devices focus on improving your ability to do everyday tasks, while minimizing the discomfort that may make these chores difficult in the first place. Before purchasing a product, consider your budget, lifestyle, and ability. Don’t worry if you need something that gives all the help you can get, since spills can lead to falls, or trying to carry something too heavy can ending up hurting you. When it comes to drinking and bottle pouring, you definitely want to find the option that can accommodate all of your needs.